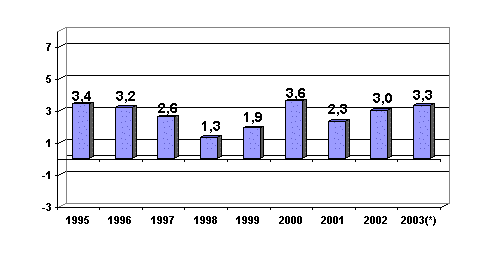 The inter-annual growth rate (June 2003 compared with June 2002) stands at 3.3%. According to data made available by EUSTAT the Construction Costs Index in the A.C. of the Basque Country increased by 0.1% in the month of June 2003 compared with the previous month, leaving the inter-annual rate for June at 3.3%. The rate for the first six months since last December has registered an increase of 3.0%. In the inter-annual period (June 2003 compared to June 2002) labour costs increased by 5.8%, while the cost of raw materials rose by 1.5%. The two main subsectors have an identical effect on the growth of 0.1% of total costs in the month of June 2003, as both the costs of Building and Public Works increased by 0.1%; the inter-annual growth rates in these subsectors are also similar, with Building Costs increased by 3.3%, while Public Works underwent an increase of 3.4%. Featuring among the prices of raw materials consumed in this sector that have undergone higher rates of inflation in June 2003 are: Lime, plaster and plaster of Paris (5.6%), Petroleum derivatives (2.7%) and Stonemasonry (1.8%). On the other hand, reductions were registered in the average monthly prices of Asphalt products (-4.2%), Electric energy (-2.0%), Glass (-1,6%), among others.